Join us on Sunday, May 12th! 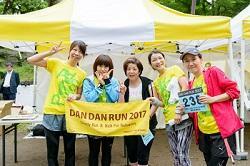 Charity Run & Walk DAN DAN Run is a fundraising run and walk event to support refugees living in Japan. This is the sixth annual DAN DAN RUN. Last year, about 280 people participated. 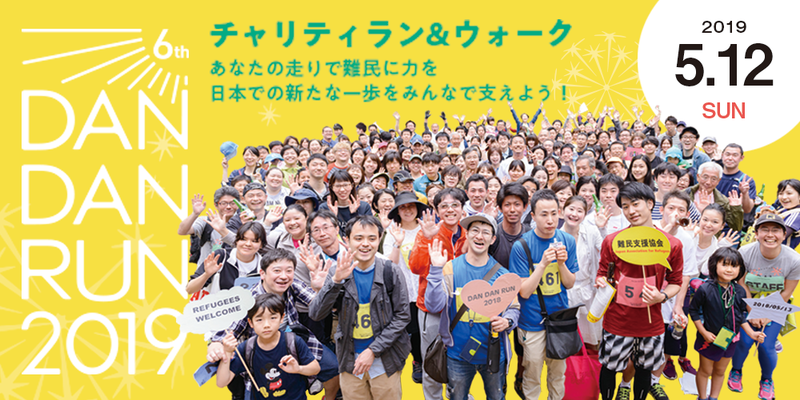 In addition to the running and walking around the Imperial Palace in Tokyo, we will have some fun events in Hibiya Park. Please join us to have fun and support refugees! This is a charity event to support refugees who have come to Japan. Today, due to various civil right violations and wars around the world, many people are being forced to leave their home countries as refugees. Many of them have come to Japan. They have to overcome a lot of difficulties to recover their everyday life they have lost in their home countries: home, family, jobs, and safe and peaceful days. The proceeds of this event will be used to support the first steps of the refugees in Japan. What is DAN DAN RUN? 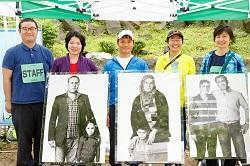 The event is managed by the volunteer "DAN DAN RUN committee" and the proceeds of the event will be used to support refugees through Japan Association for Refugees (JAR). This event is named "DAN DAN RUN," from the Japanese word "暖 (dan)" which means "warmness." Because the theme of the first event in February 2014 was "Give the refugees a warm winter, with the warmness of the heart of the participants." See the last year's event here. Proceeds of this event will be used for various activities of JAR, such as cost for sheltering, food, visits to the JAR office, medical expense for people without health insurance and other support for refugees. JAR staff also engages in important activities of consulting on applying for asylum, job searching, and other necessities of the life in Japan. Advocating for better institutional and social system for refugees is also an important part of the JAR's activities. Get your DAN DAN RUN original T-Shirt! T-shirt made in Japan. Materials used for the T-shirt are friendly to people and the environment. Carefully crafted by skilled artisans one by one, and can be used for a long time. Even if you leave the place where you were born and raised, you will take root in the new land and bloom a beautiful flower just as the fluff of the dandelion blooms. As the feeling that we think that a flower is beautiful is a common sense of values in the world, we hope for that it will be a world where people in the world can understand their feelings. A message on the back of the T-shirt is written "All Different, All Beautiful". *Depending on the inventory, we might not be able to meet your request. Price： White 3,300yen, Gray 3,000yen *It will be donated for supporting refugees. *You can also buy the T-shirt and enter the event at the same time. How to receive：We will provide at the reception in the event. Delivery is also acceptable（In that case, we will ask for cash-on-delivery）. -The design may be partially changed. -The stock is limited, so it may not be possible to meet your request. -Please kindly note that we will not receive returns or refunds. 1. The event will be held even if it rains. 2. Participants must be in good health. While the participants will be covered by insurance (the insurance is included in the entry fee), in case of an accident, the organizer assumes no liability outside of the insurance coverage. The orgniazer's responsibility is limited to providing first aid. 3. The organizer will accept no liability for any loss of belongings. 4. Paid entry fee will not be refunded in case of any cancellation, change of courses, or change of participants based on the participants' own reasons. Overpaid entry fee will not be refunded. 5. Paid entry fee will not be refunded if the event is cancelled due to the event of force majeure, or contingent circumstances such as an earthquake, flood, typhoon, heavy rainfall, snowfall, incident, accident, epidemic, etc. 6. If a participant does not comply with the instructions by the Dan Dan Run staff, the organizer is entitled to refuse participation by such person, in which case the entry fee will not be refunded. 7. All rights to post images, photographs, articles, and recordings etc. of the event to television, newspapers, magazines, the internet or other medium belong to the organizer. 8. The organizer recognizes the importance of personal information. The organizer will observe the laws and regulations regarding protection of personal information and treat personal information based on the organizer's personal information policy. Any information obtained in the entry to the event will be used for the management of this event and notification of future events. * At this event, time of running/walking will not be officially measured. No awarding ceremony will be held.